The One Man Band’s of the world are the soldiers on the front lines of the cultural war. With such sonic limitations, there is no opportunity for subtly. Instead their charge is to rattle and shake awake the sleeping potential in all of us, to right the skewed priorities that the indoctrination of modern society has gilded us with, to release us from the want of the wealth and shiny things that weigh down the human spirit while resetting the priorities of the individual to pursue the enjoyment and fulfillment of life. As honorable as all this may sound, it is dirty fingernail work that demands tremendous energy and sweat, with a payoff almost certain to not be measured in dollars or fame. Pacific Northwest product Scott McDougall’s latest vehicle for this work is his late-2010 album entitled Our New Histories; a project that boasts excellent songwriting and a strong command of instrumentation, without compromising the heart-pounding, visceral experience present in all great music. Our New Histories is a drifter’s diary. Capturing with amazing clarity the poignancy of a young man’s wanderlust and all the trappings thereof, it is the travelogue of a journey bookended by a Spring refusing to break, and the onset of Winter. In between McDougall takes us along while he hops trains, thumbs rides, finds safe places to sleep, and teaches us that a conversation sometimes can be more valuable than a career, the fellowship of a fireside chat more fulfilling than a fancy house, and how the lack of worldly possessions can be liberating. Gut-punching lines like “Our simple means show us new ways of doing things” and “If time really is money, I guess I don’t need to get paid” fill the modern soul with fresh and interesting perspectives, while McDougall recounts situations where friendships are forged and understanding and charity gleaned from strangers and familiar faces alike. McDougall is similar in style to another Pac Nor act called Hillstomp, sometimes collaborating with John Johnson in the project called “Last Watch”. 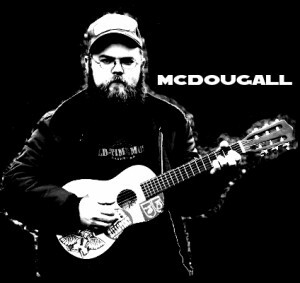 Where McDougall differs from Hillstomp is that he begins with the songwriting, and then adds the instrumentation and foot stomping approach on top. Hillstomp is arguably vice versa. But just like Hillstomp, some of McDougall’s songs are meant not to be listened to, but felt, like one of the album’s standout tracks, the instrumental “Battle Creek March”. McDougall cannot only write, he can pick and move the fingers with the best of them as well. Another signature element of McDougall is the overly-reverberating bass drum. 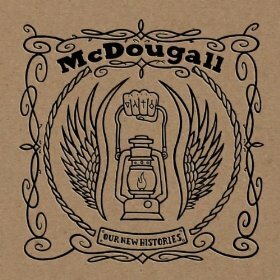 Far more than a simple tool to keep the rhythm, McDougall insists on a tremendous amount of ring from his foot stomps, which adds a carnal element to his otherwise heady, songwriting approach, creates a space element in the music, as well as contrast in some of his song’s two-part approach. Though he’s just one man, McDougall makes sure to satiate all the senses, intellectual and visceral, before the last note rings. My concern for this album is the accessibility. If you wandered as a young man or woman, or are wandering now, it will feel like a soundtrack to your life. But there are no love songs here, no bird’s flipping at bosses or tears falling in beers. In fact one of the messages of the album is to stay positive and appreciate the experience even if in the moment it appears like a negative one, but this may not create an environment for universal appeal. The inflections in McDougall’s singing will also be something some will find a polarizing topic. At first sniff, it may conjure up visions of a long-bearded dwarf storyteller in some fantasy presentation, if not hint of pretentiousness. I saw McDougall live opening for Pete Benhard of The Devil Makes Three, had made a note of his voice and warmed up to it by the set’s end, but still felt a little uneasy at the first listen of Our New Histories. But I’m over it now, and wouldn’t want to hear these songs sung any other way. Our New Histories is a few degrees shy of a concept album, but does have a cohesiveness and storyline, just like all great albums should. Aside from the accessibility issues, the album is solid throughout, taking into account numerous measurables, including the most important ones: did you learn something, and are you a better person of listening? The answer to both is a definite “yes”. MCDOUGALL!!!!!!!!!!!!!! Around this fire is one of the best tracks on the album! He is a big big reason I’m coming to Muddy Roots. We will be rocking this album a few times on our drive up! That is some great stuff. Thanks Triggerman. I saw McDougal open for Los Duggans and Hillstomp last year. (another great band by the way.) He put on a solid performance, and I especially enjoyed his style of the banjo, more of a strumming technique. It’s nice to see a little experimentation. Yeah, he plays a 6-string guitjo. My girlfriend, a guitar player and now (thanks to me) banjo lover, really wants one. I want everyone who comes to see him at Muddy Roots to constantly yell “MCDOUGALL!! !” after songs, cause it’s what we do out here. John from Hillstomp actually started it, and on Scott’s “compilation” album you can hear a guy yell it in the crowd after a song. “Battle Creek March” is my favorite song for him to start off a set with, and “Struggler’s Medley” is my favorite off the album. Bear with it, it begins slowly. We’ll make sure he plays “Highball Breakdown” at MR too, since it rocks so damn much! And, considering we’re his ride, he owes us! You guys are in for a treat! I second everything RyGuy just said. Except he should also play The Cotton Pickers Song and Grandma Set The House on Fire. I LOVED this guy’s set at Muddy Roots! Even though he only played for like 20 minutes, it was amazing. I’m really glad he’s coming to town in nine days and I’ll get to see him again. I will certainly be picking this album up then! I agree, Aran. And I so loved yelling MCDOUGALL! With the NWDBF folks! Good times great memories!